Here are pictures and descriptions of some of the plants and animals that you might see during your trip to the Fiji islands. You may not see all of them, but you will certainly see some. The ubiquitous coconut for example. If you step out after dark, you will be sure to see geckos on the walls and cane toads along the pathways or grassed areas. 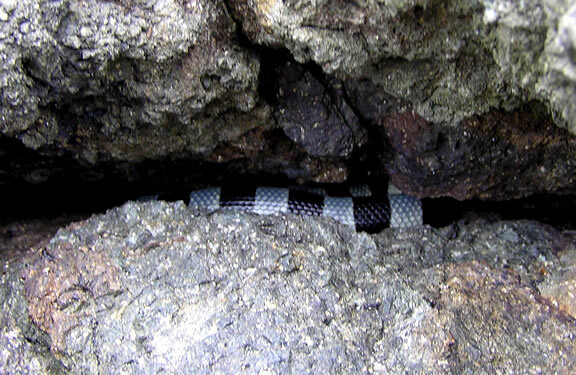 Luckily, Fiji is not a destination where you have to be overly cautious about venomous creatures... some do require you to be sensible (don't try to pick up a black banded sea krate for example!) but in the main, you are pretty safe. As I travel around this beautiful country, I find myself snapping pictures of some of these plants and animals. Flowers in particular will often catch my eye, so here are a few of the pictures taken on my last visit, with a brief explanation as to what they are. This is not exhaustive by any means, and not all of these are native to Fiji either. But they are things that you might come across during your own travels. Just select one of the tabs below to browse, and if you want to see an image at a larger size, just click on it. Enjoy! You simply can't avoid seeing coconut trees when you're in Fiji, and lots of them. They are everywhere, lining every beach, groves in every resort, and growing wild on the roadsides. 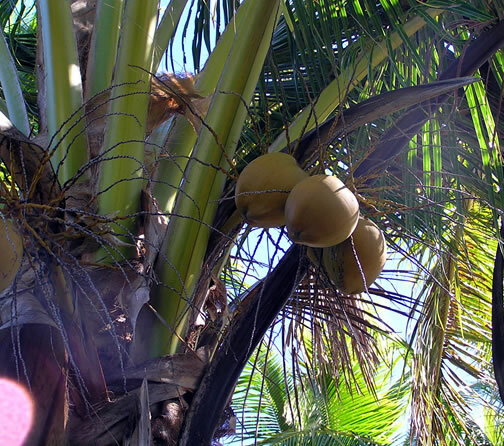 Contrary to what you might think, the best coconuts are the young ones, that aren't quite mature. These not only have softer sweeter flesh, but they are full of coconut milk. The older the coconut, the less milk. Locals refer to the young ones as bu (pronounced boo) so if you are purchasing a coconut for the milk, make sure you ask for bu. This is an introduced species, and locals consider it worthless. It grows up to 20meters in height, and the wood is soft so of little use for anything, not even firewood as it burns too quickly. It has really taken a liking to Fiji, and you will see it everywhere. 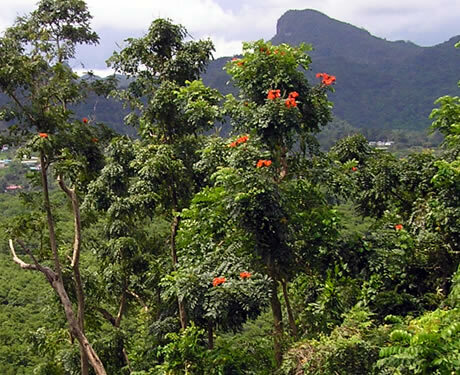 The pretty orange/red flowers come out from October, but don't confuse it with the other red flowering tree, the Flame tree. You will find this beautiful tree along coastlines, both in garden settings and growing wild. 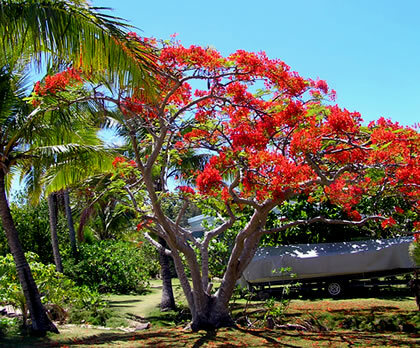 Fijians know it as the Flame tree, and it is known to herald the start of the Christmas season. This is the reason for it's other common name, the Christmas tree. It generally begins to bloom once the Diwali Festival is over (held late Oct-early Nov) and locals know that when the flowers come out, it is truly summer. 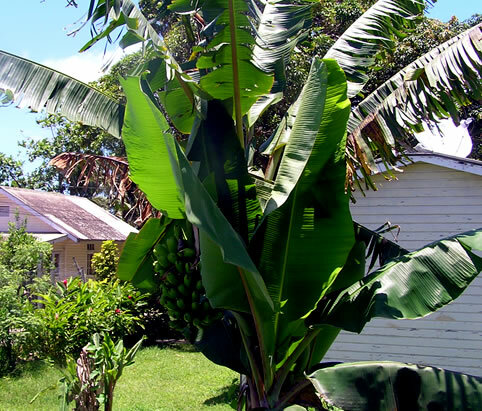 At first glance, the Plantain looks very much like a banana tree. They are in fact a close relative, but the taste is nothing like a banana. 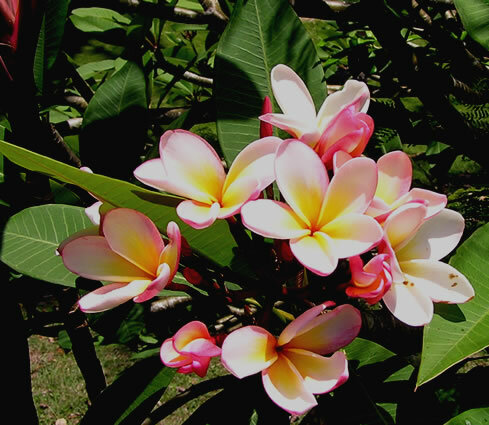 You will see these growing all over Fiji, and bunches of it can be bought cheaply at any market. Unlike a banana, these are generally cooked, not eaten raw. This is sometimes referred to as the Pandanas palm, though in fact it is not even a close relative of palm trees. The one photographed is one of the bigger ones that I've seen, and they can be found in coastal regions of Fiji. Locals use the leaves for handicraft work, and you will sometimes drive through a village and see the leaves spread out to dry in front of some of the houses. Many of the woven hats, carry bags and so forth that you find in craft markets have been made from the leaves of the Pandanas. The trees also have large fruits that I'm told are edible if prepared correctly. 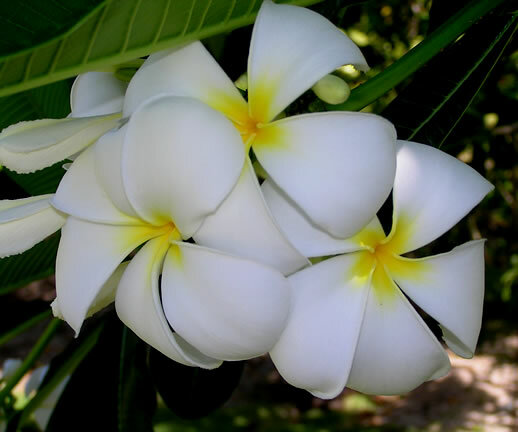 How could we start this section with anything else other than one of Fiji's most famous flowers... the Frangipani. There are actually many different varieties and cultivars, but the one you will see most often, is this, the large creamy white specimen. These grow reasonably large, I have seen them up to 5-6 meters in height. 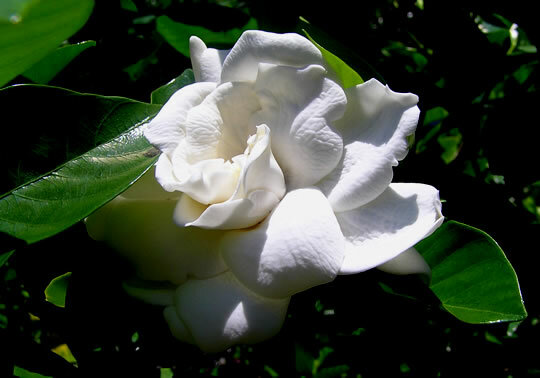 There is a smaller variety that seems to be quite common... pinkish with smaller flowers, and it is even more fragrant. 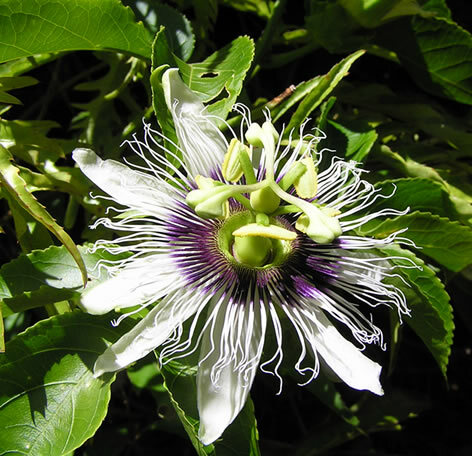 Not a shrub, the Passion plant is a vine, with the most gorgeous flowers. This one caught my eye whilst visiting the island of Nananu-i-ra, and it was in full flower in mid November. 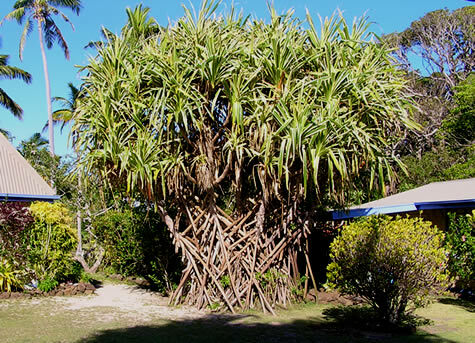 These do grow wild in Fiji, although you are more likely to see them in a garden setting. 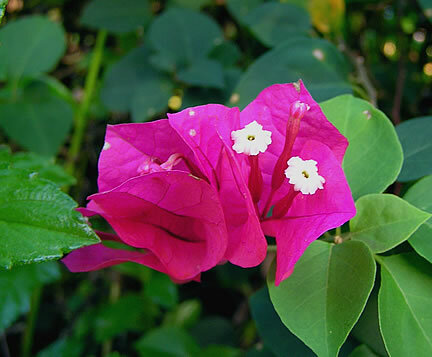 Another popular flower, that thrives in tropical/sub tropical climates. 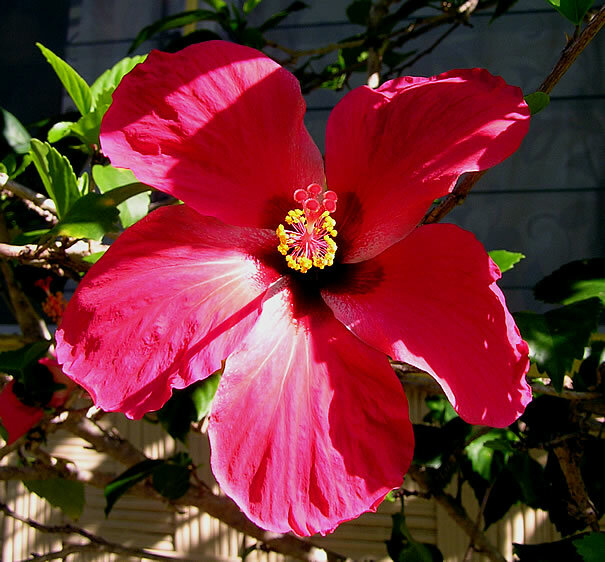 I often see the Hibiscus described as fragrant, but I have yet to detect any scent from them. Occasionally the very lightest perfume, but barely noticeable. Perhaps there are fragrant varieties, but maybe not in Fiji? These are generally said to grow up to 6' in height. And yet the bush that this flower was on, was at least 8' in height, and had been pruned to keep it to that height. Who knows how high it would grow if left unchecked... there was another bush in the same garden that was perhaps 9' and that was with the tops of the branches pruned off. This has a lovely scent, especially in the evening. It's one of my favorite flowers (next to the rose, which unfortunately doesn't do well in Fiji). Strangely enough, you are probably more likely to see this on land than in the water. While the sea krate is highly venomous, it is also very docile, and won't bite unless provoked. However, even knowing that I still didn't feel the urge to pull this one out of it's rocky crevice to get a better picture. They often come onto land to rest, and you might see them in rocky crevices, on the beach, or even coming for a look around your beachside bure. If that happens, don't panic, it's not going to bite. We certainly don't suggest aggravating it by picking it up, but if you leave it alone, then it will do the same. If you are in Fiji for the diving, then there is always a chance you will come across one of these... a sea turtle. 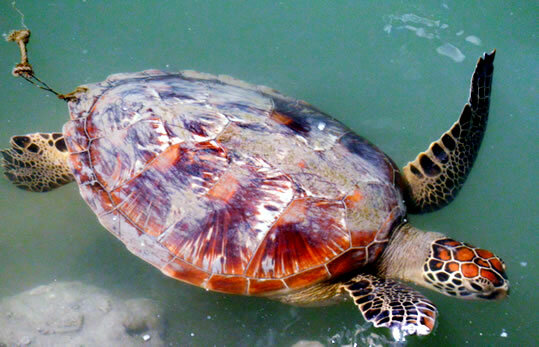 This one is tame,and along with 6-7 of her friends, lives in a sanctuary for injured turtles at Golden Point resort. They get fed every day, so if you happen to be around at feeding time, then you can give them their daily ration of fresh fish. Cane toads were originally introduced into Fiji back in the 1950s, to combat various destructive insect pests in the sugarcane fields. It has become extremely widespread, and you will definitely see them hopping around if you venture outside at night. Rain will bring them out en mass, though they can be seen during dry periods as well. They seem to be quite at home in towns and cities just as much as in country areas. 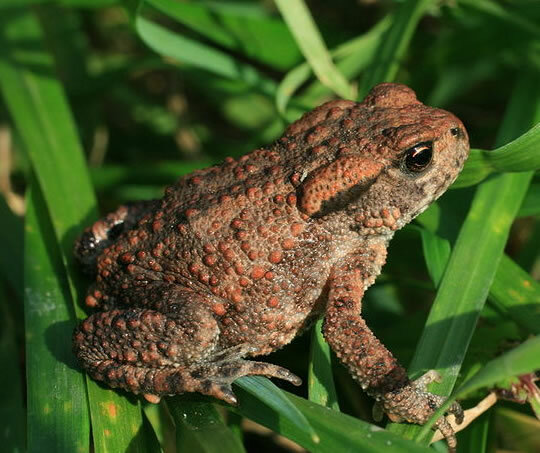 The toads don't appear to grow to the same size that they do in Australia. 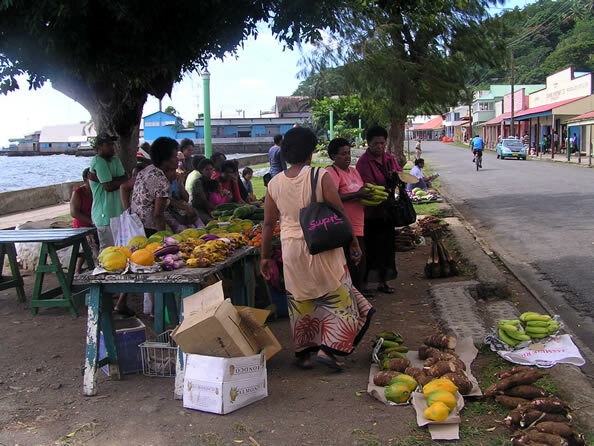 Common across most of the Fiji islands, you might find their noisy squabbles over fruit will disturb you at night during the mango season (Nov-Feb). There are 3 types in Fiji, but only one of them is commonly seen, the Polynesian Flying Fox. If you look up in the evenings, you may see fruit bats flying overhead. The Suva area is a great place to see them, and there is a big roost of them beside the Presidential Palace. 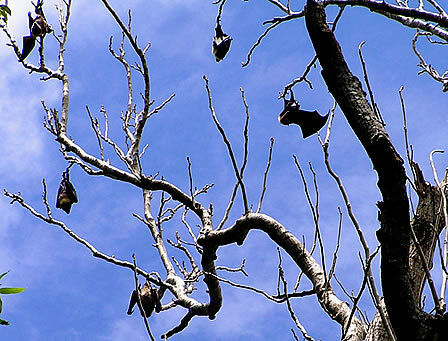 You can see them from the road... 100s of bats hanging from the large trees in the parklands. The ones in the photograph were in an old mahogany tree in the Sigatoka Sand Dunes. These are massive... even with wings partly folded the span is well over 3". This one was on the kitchen floor last night, so of course I had to get a few photos of it. 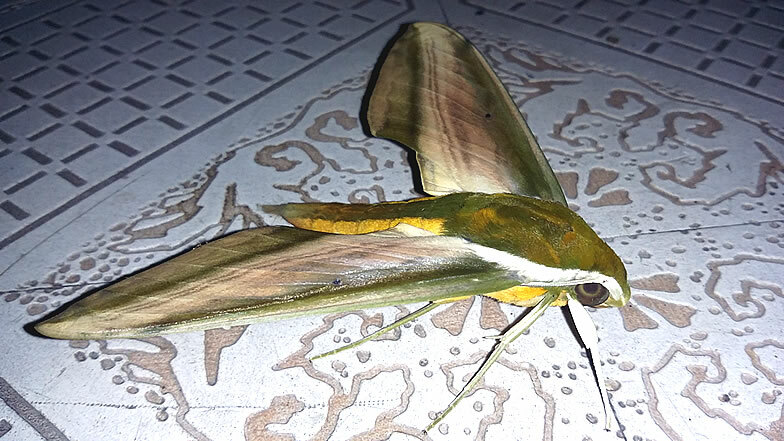 One of the more beautifully colored moths, they are the size of a small bird. They tell me that these are pretty harmless and won't sting unless they feel they have no choice. However, they certainly look mean, and this particular one had us both hiding in the bathroom while we waited for the flyspray to take effect. They often build their little mud nests on beams or walls inside, so chances are good of coming across one in Fiji. Locals seem unconcerned with the size of them, and just brush them away if they come too close. However, that thorax section is just too creepy for me to dismiss them that lightly. Unfortunately, I just can't find any reference to an insect that I have little affection for... a small black wasp that comes out at night and has a very nasty sting. It is about the same size as a common black and yellow wasp, but is blackish in color and seems to be attracted to outside lights, the same way a moth is. 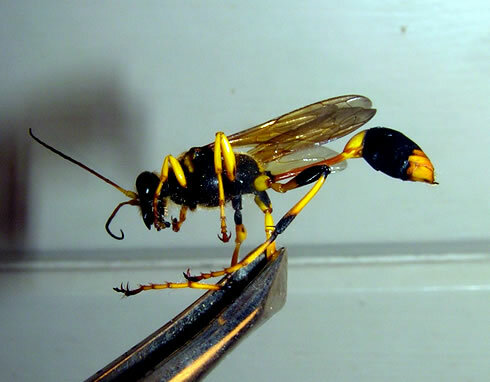 I was stung on the foot one night while sitting outside in Nadi, and the sting is certainly right up there compared to "normal" wasps! I didn't get a picture of it, as I didn't have the camera... not that I was thinking of photographs at the time anyway. So you have been warned. If you see what appears to be a blackish wasp hanging around your outside lights at night, keep well away. They hurt! 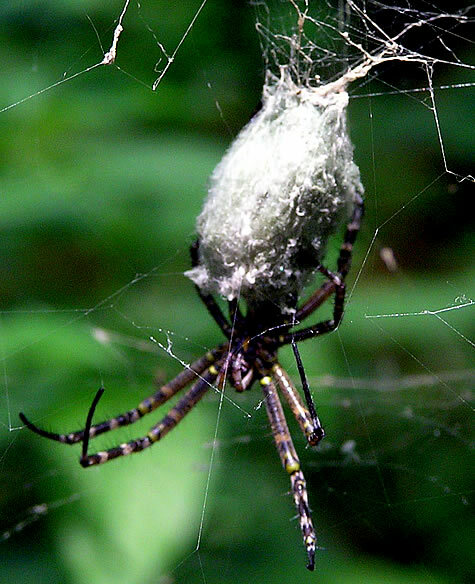 This particular one was photographed in the Sigatoka Sand Dunes National Park, and while they are generally known as an orb spider, I have heard them referred to as "Banana spiders" by local people. I'm not sure why, as they don't have any predilection to building their webs around banana trees, as far as I know. The cockroaches in Fiji grow to a large size... perhaps up to 3" or more in length. I'm told that when you get them coming around your house at night, it's a sign of rain. Unfortunately, they are just too fast to get a picture of. While they are a bit creepy for anyone that doesn't like bugs, they are totally harmless.